Escape into the Wild is part of our Wet & Wild collection. 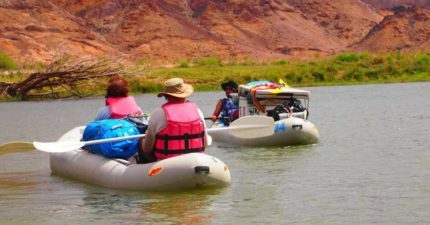 It is the ultimate short stay option for those who want to get a taste of the Orange River and Richtersveld, but do not have much time to do so. You will spend a night under a star studded sky and take a short walk to a scenic viewpoint showcasing the surrounding mountains. Escape into the wild is a great entry level adventure. It is an experience suitable for all ages and families with young kids are welcome. The trip starts at our base camp The Growcery. 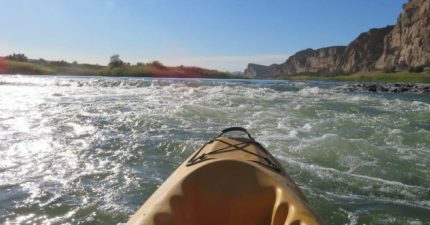 We intend to paddle, float, bird watch and relax for 3,5 km downstream from camp. Here we will arrive at a place that we call Kitchen Caves or “swiss roll”. You also have a beautiful view of “Fingerprints” also known as Snail Mountain from this river spot. 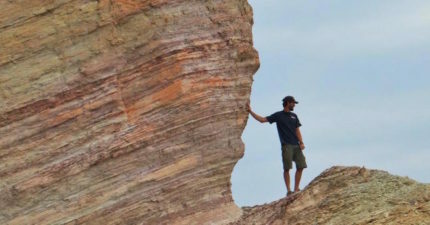 There is a large sandbank at the bottom of a rugged Richtersveld mountain. Our overnight camp will be here. Escape into the wild includes a guided hike with spectacular 270-degree views of the Richtersveld. You have a choice of meal preferences, and we also cater for vegetarians and vegans. Just let us know in advance. 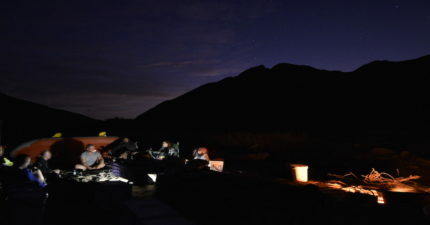 All the meals are prepared old school on open fires and under the celestial skies of the Richtersveld Desert. One amazing experience of the Richtersveld is the fact that you can sleep next to the fire in the open air. One of the few places left where this can be done. For many an intimidating thought, but so rewarding at the end. This short Escape into the Wild adventure is perfect for introducing wild camping. Very popular amongst travellers passing through this area. Day 1: Arrive at The Growcery Camp no later than 12 pm. 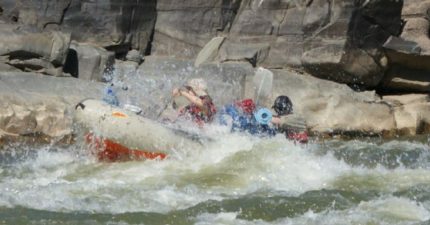 The rafting trail is surrounded by granite rocks, lava deposits, and sheer cliffs. The beautiful mountains and reed beds along the banks of the river will guide you to the overnight campsite. You can experience extraordinary birdlife. The Escape into the Wild is the perfect short stay adventure suitable for the whole family. Sleep on the banks of the Orange River and under the star-studded Richtersveld night skies. What are the youngest realistic ages for these trips? – We suggest from 5 years and older. Is there malaria in this region? 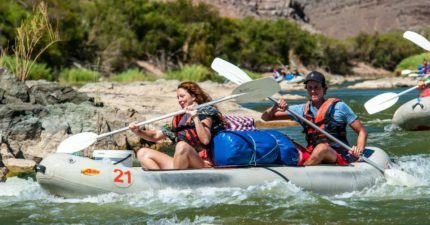 – The Orange River is a malaria free zone. How far is this trip? 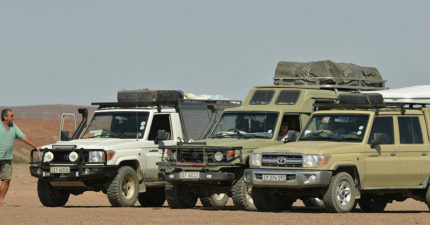 – Anything between 3,5 – 7.5km depending on the water levels. What about a medical kit? We suggest that you bring your personal equipment. RATES INFO: 50% Deposit is required to secure your reservation. Escape into The Wild Adventure. Arrival time for the escape into the wild is 1:30 pm. Our team will meet and greet you on arrival, and your guide will give you a full briefing on packing and what to expect on the Escape into the wild adventure. Departure Time will be 2:30 pm and you will set off towards your wild overnight camp for the evening. This afternoon after 2 hours of paddling and exploring the Orange River we will set up camp and embark on a hike. This hike is possible in the afternoon or the morning before breakfast. 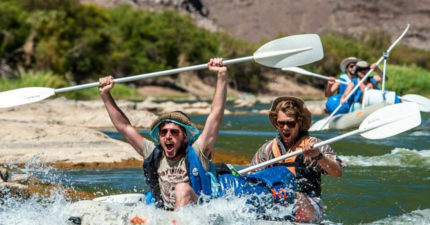 The perfect short paddle and wild camping to enjoy the Richtersveld and Orange river. This adventure is ideal for the short stay traveller that seeks a wild adventure for one night. After sunrise and hearing the birds calling we will enjoy a hearty cup of coffee and a healthy breakfast. Our morning is relaxed, and we take our sweet time paddling back to Base Camp – The Growcery. The morning paddle is perfect to search for the kingfishers and fish eagles of this area. A morning paddle is an ideal start to the day, and after 2 hours we will be back at The Growcery camp. Your adventure comes to an end when arriving back at camp. All adventures are welcome to stay and relax or proceed to the next adventure destination.